Not my copy (need a new scanner), but the same version, great cover. Once again, I must pat myself on the back for my instinct in finding previously unknown books that I end up really liking. I don't know how long this run will last and how painful it will be when it ends, but I am on a damned impressive streak, if I do say so myself! I found Case File: FBI in a bunch of post-move trash in an alley last summer. I was a bit skeptical, but the cover was just too cool (when I see an image like that it makes me question whether I truly made the right choices in my own life; I think I would have thrived kicking down doors in a suit). The book itself turns out to be as cool, a tough, taut, well-written procedural that captures the day-to-day of the life of a Chicago FBI office as well as delivering a gripping, interlocking crime narrative. To Rip it was like a thousand other nights. Yet always the feeling of the first time possessed him, not of foreboding, nor apprehension, but the strange sensation of wondering what was behind the door they soon would walk through. It was never the same twice, and yet it was always the same. People talked, words came spilling out, and by those words, rather than by the tommy guns or the .38s, killers were captured. Words chased men, harried them, cornered them, broke their spirits, sent them to the chair. There are three storylines going on here and it takes a while to get all the people organized in your head. They eventually come together to form a mostly coherent whole, but they begin as separate cases. The book starts with two officers going to investiage an anonymous tip and one of them getting shot and killed. The other officer, the protagonist John Riply (or Rip) then has to go through his dead partner's active files to figure out which case the tip was connected to. The first case, and the emotional through-line of the book, is about a young widow who starts receiving extortion letters. They want the $10,000 she inherited from her husband's death in exchange for her daughter's safety. Nasty stuff and convincingly portrayed. The authors spend a lot of time on the woman's personal life and it is an interesting portrayal of the pressures on a single woman in that period. The second case is a fugitive on the run and the third is a car theft ring. There is some tough stuff in this book and I am reminded once again that things from back in the day could be pretty darned hard, even if we think of it as a more innocent time. It also glosses over the political element of the FBI, with only a passing mention at the beginning of communist infiltrators. This book was written at the beginning of the Red scare and what the FBI were doing in real life was far from the heroic, selfless public duty that is so appealingly portrayed here. 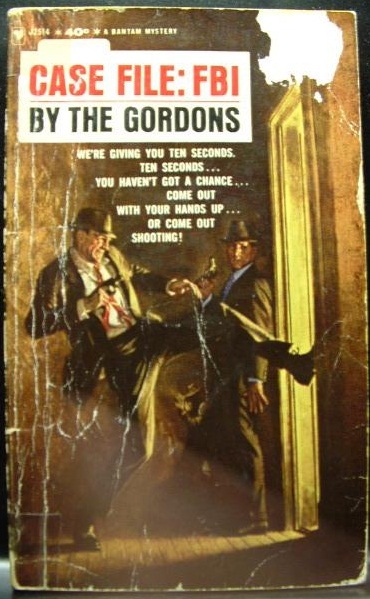 A bit of internet research tells me that The Gordons were a husband and wife writing team, Gordon and Mildred Gordon, who wrote novels and screenplays. Case File: FBI became a movie called Down Three Dark Streets which I shall have to look out for. Holy crap, I read a book! Found this one at a used record store near my house that I have walked by a thousand times but never gone into. It's the kind of place that I haunted in my high school and college years but have long since grown bored with. However, something drew me in on that day and it turned out that they had a big, messy pile of old pulp books in the back corner. They were in terrible condition and overpriced ($5 each), but I spent some time going through them (and organizing them) and picked out this one. Despite having two other books half-read (since March! ), I jumped into it and found it engaging enough that I made it to the end. In fact, Accident by Design was honestly a really well done classic British mystery. I was quite surprised, expecting something subpar and generic. It was well-written, with interesting characters and some great descriptions of the British countryside and the work done on a tenant farm. The story is about a family estate in the early '50s. The patriarch lies in bed near death, but still quite aware. His eldest son is a feckless alchoholic with a middle-class (bad), Australian (worse) wife who hates pretty much everyone his father employed and has threatened to make a clean sweep when he takes over. When they both die in a car accident, too many people benefit and this alerts the local constabulary (who are very well depicted in the best British tradition of the no-nonsense, practical, reasonable police force). When their surviving son dies a few days later, by seemingly eating some poisonous berries, the game is truly afoot. It's a solid, enjoyable read that spoke particularly to me because of the British countryside angle. There are some great walks and agricultural discussions. The police as well are just awesome in the way their supervisor listens to their hunches and lets them follow their instincts, within reason. Very satisfying. 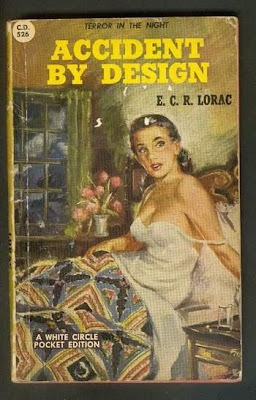 I learned later that E. C. R. Lorac is the pseudonym for Edith Caroline Rivett whose works are very well-respected (she is considered a prime representative of the golden age of British mysteries) and whose books are even collectible! (Though I doubt this paperback is worth anything, given its state.) I will definitely be keeping an eye open for her in the future. And let's hope this kickstarts my reading for 2013, because I gots some catching up to do!